$100 if purchased at the door with a waiver signed by both parent and student. Parent Chaperones are a big part of the success of Project Graduation! As a Freshman, Sophmore or Junior parent you can volunteer to experience the event before your student has the opportunity to attend. Volunteer this year and share in the excitement with your upcoming Senior. 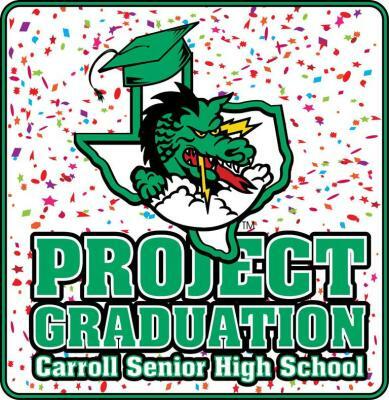 What: Project Graduation is a drug and alcohol-free celebration held for the Carroll Senior Class right after the graduation ceremony. Nationwide, Project Graduation events have an overall attendance rate of 63%. At Carroll, we have averaged 85% participation by our graduates. This event has proven to be an effective means of combating needless accidents involving graduating teens on one of the most important nights in their young lives. Why: We expect 600+ of our graduating seniors to walk through the doors of Main Event in order to have one last safe and fun celebration with their classmates. How: We could not do this without the support of the school staff and administration and dozens of parent volunteers who will ensure that the graduates are safe and will provide the power behind this fun-filled event. We also owe a huge THANK YOU to the Craft Fair committee for all their efforts in support of Project Graduation. Because of all of you, the graduates will be able to enjoy a night of games, music, food, prizes and most of all, memories with their classmates to last a lifetime. We hope Project Graduation will be the culminating event of a great year for the Class of 2108. Questions? Interesting in volunteering, sponsoring or donating? Contact our Co-Chairs.